Monsoon. The season that comes with a mixed feeling of gloom and blues coupled with a sigh of relief from the summer heat. Monsoon rains can be exciting for a few days but once it becomes recurrent, we just sit tight and wait for winter to engulf us with its cool climate. For all those who confer with these feelings, travelling during monsoon might be off-putting since the whole country experiences rains of some extent. But worry not, because in this article you will find out about the 6 places that you can visit to escape the rains of monsoon. Ladakh, the land of high mountain passes, is a high altitude desert land. This land which will make you believe in paradise, is surrounded by two most magnanimous mountains, the Himalayas and the Karakoram mountain ranges. Since it is actually a desert, Ladakh hardly sees any rain during monsoon. Ladakh is surrounded by nature's beauty in the most pristine form, where you can witness snow-capped mountains, spellbinding lakes, waterfalls and melting glaciers. It is certainly the go-to place if you want to avoid the monsoon rains. What better way to beat the monsoon rains than by visiting the great desert of Gujarat? Rann of Kutch in Gujarat is a huge land of salt marsh, located in the Thar Desert. While one side of the desert is just sand, the other side consists of the sea. Rann of Kutch must be visited just to see the beauty of indefinite land of golden and undulating sand. Rann Utsav is 3-4 boisterous festivals celebrated in the month of December, when the whole region comes to life. You can witness the folklore, culture and tradition of Gujarat during this time. 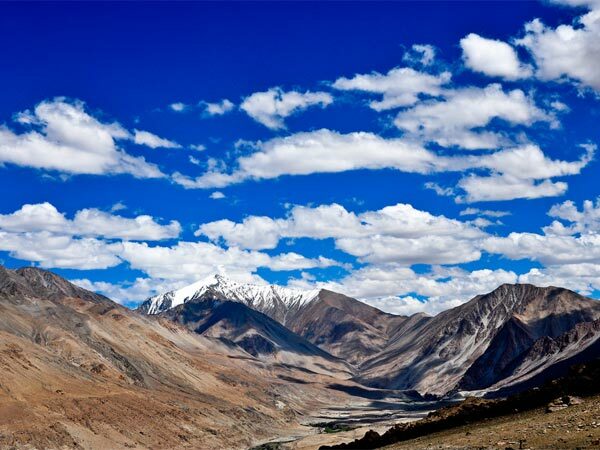 Spiti is a cold desert land that is also known as Little Tibet due to its similar vegetation and climate to Tibet. Spiti is another magnificent region of India, that words fall short to describe. It is known for its pristine natural beauty and monasteries galore. Spiti, like Ladakh, is a high altitude desert due to which rains are very minimal in general. Visit breathtaking places like Chandrataal Lake, Key Monastery, Kunzum Pass, etc. in Spiti. Since yellow sandstone is used in the architecture of almost all the magnificnet forts and palaces of Jaisalmer, it is fondly known as the "Golden City". The Jaisalmer Fort crowns the entire city, perched on a hilltop. A visit to the fort will give you a rich knowledge of the royal history of Rajasthan. Rainfall is relatively much lesser in Jaisalmer compared to the rest of the country. You can peacefully visit the fort, the Jain temples, museums and other such constructions found in the fort during monsoon. In fact, the weather is bound to pleasant at this time. Amritsar, the cultural centre of the Sikh community, is a beautiful city located in Punjab. Historically, Amritsar is famous for the magnificent Golden Temple, the most holy temple for Sikhs from all over the world. Amritsar is also known historically for the occurence of Jallianwala Bagh massacre. Visit Amritsar, have the Amritsari cuisine and travel to places like Wagah Border, Guru Ke Mahal and Hall Bazaar, to name a few. North Karnataka is a region that receives the least rainfall during monsoon in all of South India. Right from Bidar to Bellary, North Karnataka is filled with tourist attractions that you might be interested in. Plenty of sanctuaries like Ranebennur, Bhimgad, Anshi and Attiveri are found. Haveri, Gadag, Annigeri are some of the places where you can plan a pilgrimage to. Bidar has the famous fort and remnants of the past that can interest history buffs.